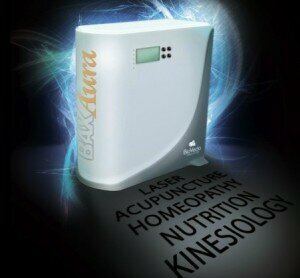 Energy Medicine Series: What Is BAX Technology? In the first post from BioVeda’s Energy Medicine Series, we explored the definition of energy medicine and how Dr. Joseph Mercola, arguably the most famous of complementary and alternative medicine physicians, uses it in his practice. We defined energy medicine as any healing technique that utilizes known energies such as magnetism, electricity, sound, or light. We established that most applications of energy medicine are accomplished through the use of frequencies that mimic those of substances or stressors in our environment. Dr. Mercola is using Meridian Tapping Technique (MTT) and Autonomic Response Testing (ART) to utilize energy medicine in his practice. MTT uses the kinetic energy of finger tapping in conjunction with positive affirmations to break negative associations in the patient’s life. ART is a biofeedback method that uses changes in muscle tone as its primary indicator. For example, if a slide with a tumor biopsy is placed over the body where an identical tumor is present, the body sends a stress signal that causes a strong indicator muscle to go weak. The issue with Dr. Mercola’s approach to energy medicine is the reliance on the practitioner to administer these techniques correctly or even perfectly to achieve the desired results. What if a practitioner is under stress during the test? What if during ART the patient responds to the slide containing the tumor rather than the tumor itself, wrongly indicating a problem? BioVeda Technologies has combined state-of-the-art computer programming and equipment to administer energy medicine and holistic healing techniques in an automated and fully reliable fashion. Taking out the guess work and possible practitioner bias, while fully automating the therapy, allows BioVeda to offer its patients the best technology has to offer and the centuries-old healing practices the patient desires. How Does BAX Technology Work? BioVeda’s BAX system and technology is based on the idea that by reducing or eliminating the body’s stress reaction to environmental factors using a combination of Meridian and Energy Stress Assessment (MESA), laser therapy, nutritional supplements and homeopathic medications, one will experience symptomatic relief. 1) Stress causes or exacerbates most health related conditions. 2) A general reduction of stress levels can significantly decrease symptoms of many conditions. 3) The brain creates associations between stressful events and substances which are often times inappropriate and subsequently lead to a host of chronic and acute conditions. In order to break these stress-inducing associations, the BAX 3000 and the BAX AURA expose the patient to digitized frequencies that mimic the frequencies of substances in the real world. If the substance causes a stress reaction in the patient, then a protocol is used that simultaneously calms the autonomic nervous system while the patient is exposed to the frequency of the suspected stress-inducing substance. This exposure coupled with dietary supplementation and homeopathic medication works by retraining the body to have a positive or neutral response to the stressful substance rather than a negative one. The frequencies are achieved through the use of a cold laser, thus utilizing low level light therapy (LLLT) to stimulate the autonomic nervous system. Sound familiar? By utilizing known energies, in this case low level light, as a healing method or technique, we have satisfied the general definition of Energy Medicine. The low level light is passed over the body’s acupuncture points and biofeedback is registered through the device and its software to determine which substances cause the body stress, thus combining two holistic healing practices (acupuncture and applied kinesiology) and bringing them up to date with modern technology. In our next installment of our Energy Medicine Series, we will further define acupuncture and applied kinesiology to explore how they are utilized by state-of-the-art BAX Technology coupled with dietary supplementation and homeopathic medication to promote holistic healing for the discerning patient. We will describe how using modern technology to administer holistic healing techniques, we eliminate the practitioner bias of traditionally administered energy medicine. Please check back to learn how the BAX 3000 and BAX AURA can help you or someone you love through decreased stress reactions and increased wellness! For more information, please contact BioVeda Wellness today.